The Australia v Fiji clash which took place 60 years ago this week, on August 9, 1952 at the Sydney Cricket Ground, was a match that might easily not have happened. The tour itself had briefly been called off earlier in the year. That decision was reversed, but not without prophecies of doom from Jeff Noseda, until a few months earlier the secretary of the New South Wales Rugby Union, who called the tour 'dangerous and risky' for the union, which he reckoned could lose up to £2000 on costs calculated at £6500. Nor was the Test on August 9 part of the original tour schedule. But it was added after the originally scheduled match, at the SCG two weeks earlier, was played in such foul weather that every other sporting event in the Sydney area was called off. An attendance of only 13,457 for the match on July 26, which Australia won 15-9 in spite of conceding a try in the first 15 seconds, was a huge disappointment after the crowds the tourists had pulled in for their earlier matches. The second Test was added to make up the deficit. For the Fijians these Tests were their first head-to-head clashes with one of the established rugby nations. They had made a huge impression in New Zealand a year earlier, with the New Zealand Rugby Annual naming three of their number among its five players of the year and rating wing Joe Levula the best in the world, but had played against the Maoris rather than the All Blacks. For the Australians, it was a business proposition. They were, as historian Jack Pollard recalls 'Desperate for funds and fearful of the high cost of bringing visitors from Europe". What might now seem the obvious option was a non-runner then - one reason why they were broke was that the All Blacks had pulled in only 40,000 across a three-Test series in 1951. One factor, it was reported, in the NSWRU decision to back the tour were letters from Australians who had played in Fiji reporting that their players 'were just as spectacular as the French league players'- who had toured brilliantly in 1951 - 'but without the Frenchmen's temperament'. Those prophecies were rapidly fulfilled. Ian Dieler's history of Queensland rugby records that 'The Fijians proved gigantic crowd-pullers, with confirmed league enthusiasts drawn magnetically to their games'. They pulled in 17,000 for the first match, against South Harbour at the North Sydney Oval, and news spread rapidly of their playing style. Phil Tressider of the Sydney Telegraphy wrote of 'spectacular football in which the players flung amazing overhead passes, sometimes almost the width of the field, and made clever switches of attack that bewildered the Australians'. After their first visit to the SCG, a gripping 14-14 draw with New South Wales watched by 38,699, the largest union crowd in Australia since the war, ARU treasurer Laurie Evans reported that 'No previous touring Rugby Union team has ever covered its expenses in three matches'. "Fiji had won 17-15. Australia had scored four tries to two, but lost because three kickers combined for five kicks while Ranavue and Vatabua landed goals reliably for Fiji." The match on August 9 more than justified the decision to extend the tour. It pulled in more than 42,000 spectators, generating a gate of more than £5,000 and taking the profit on the tour to more than £10,000, transforming the finances of the Australian game. Those fans saw an epic, with the lead changing hands several times and a gripping conclusion. The tourists led 9-6 at the break, but were rapidly pegged back by a try from Nick Shehadie, the Lebanese-descended prop destined to become Sir Nick, Lord Mayor of Sydney. A 35-yard drop by fullback Taniele Ranavue restored Fiji's lead, but then a break by loose forward Colin Windon created a score for wing Eddie Stapleton and it was 12-12. There it stayed until the last few minutes when, from a line-out 30 yards out, Fijian outside-half Wame Salabogi broke through and charged over under the Australian posts to leave his half-back partner Suliasi Vatabua a simple conversion. In the closing moments, Australia were stuck on their own 25. 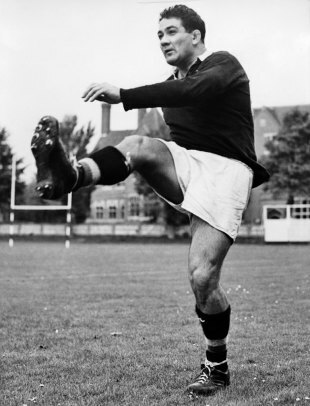 The Sunday Herald described what followed: "Australia won a lineout, and the backs handling beautifully and running strongly, cut through the defence and flashed downfield. Breakaway Col Windon and centre Herb Barker supported winger Eddie Stapleton as he neared the tryline. When Stapleton was tackled, Barker snapped up the ball and passed out to Windon, who scored in the corner. "The crowd roared, though many spectators realised that there was little hope of levelling the scores. The sideline kick was difficult, and had to be taken under pressure. Stapleton missed with his attempt, but could not be criticised for his failure"
Fiji had won 17-15. Australia had scored four tries to two, but lost because three kickers combined for five kicks while Ranavue and Vatabua landed goals reliably for Fiji. While Australia were counting their windfall, the tourists could celebrate the best result in their history. Not until 2007, when they evicted Wales from the World Cup at Nantes, did the Fijian 15-a-side team record another victory of comparable quality and significance. Nor was there anything terribly wrong with the Australian team they beat - a month later 12 of the same players beat the All Blacks at Christchurch. The Fijian team left an indelible mark on the rugby history of their own country, and that of Australia - and not only on the field. Few tours have been safer from drunken off-field incidents, since nearly all of them were Methodists and teetotallers. And while rugby teams habitually make an impression on female hotel staff, the Fijians may have been unique in doing so by insisting on helping to clean and tidy their own rooms.